Big Challenge! Judo Senshuken (ビッグチャレンジ！ 柔道選手権, Big Challenge! Judo Senshuken? lit. Big Challenge! 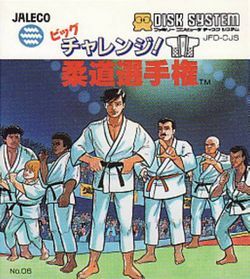 Judo Championship) is a Judo-themed competitive sports game developed for the Famicom Disk System and published by Jaleco Entertainment in 1988. It is the first title in Jaleco's "Big Challenge!" series. The object of the game is to defeat the opponent using legal Judo moves. This involves a lot of grapples, pins and throws. Defeating one opponent allows the player to work their way up the tournament ranks to progressively tougher foes. This page was last edited on 5 May 2014, at 16:10.